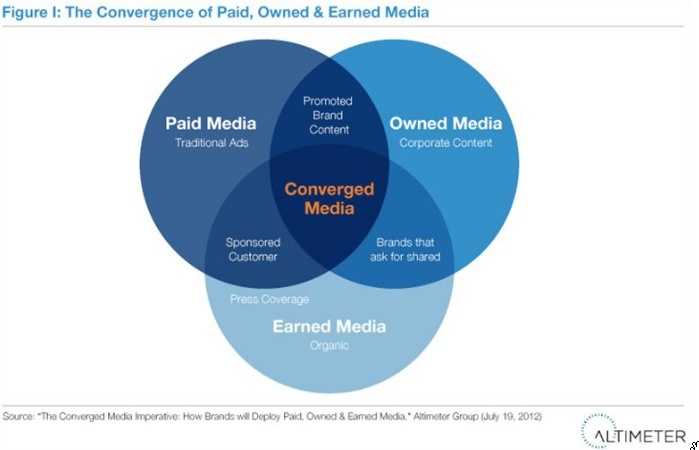 In a recent report by the Altimeter Group, “The Converged Media Imperative: How Brands Must Combine Paid, Owned and Earned Media,” there was a strong rallying cry for what many companies know they should be doing, but very few know how or where to start: media convergence. In order to meet changing “multiscreen” consumer behaviors (i.e., the people who read on their tablet, watch TV, have one eye on their laptop and check their mobile phones constantly… sound familiar?) companies must find a new way to be in the right place at the right time, with the right kinds of media. New combinations of paid, earned, and owned strategies must be uncovered; ones that blend the perfect combination of these methods to meet your company, and consumer, needs. How can this be achieved? This report reviewed more than 70 case studies and conducted interviews with industry experts and corporate practitioners to share insights, best practices, data, and inspirations for starting this challenging — yet necessary — initiative. Strategy: In the strategy stage, you should gain an enhanced awareness of how changing consumer behaviors impact your media strategy, and ensure that the various media types are given balanced attention and consideration within your company. Organization: Interviewees Reggie Bradford (CEO, Vitrue) and Michael Chin (VP Marketing & Business Development, SocialFlow) emphasize the importance of achieving a level of earned media (via social media initiatives), while others indicate that organization of your team members is a key step prior to embarking on a convergence strategy. This means bringing all stakeholders (internal across departments, and vendors and agencies) of each type of media to the table to work collaboratively towards a common goal. Production: While your team must be aligned, so too must your content across all your channels: online, print, paid, owned, earned — you name it. Allowing for a flexible strategy is also key, as it is likely your strategy must evolve with time and experience. Finally, don’t forget influencers at this stage, and make sure you have a strong grasp of their capabilities, strengths, and contributions to your earned media. Analysis: A system for listening and monitoring — not only social media mentions but your overall convergence performance — is something to be established and solidified before going too far down your path. This, along with your flexibility, will ensure you are always adjusting to create the best media programs for your company. 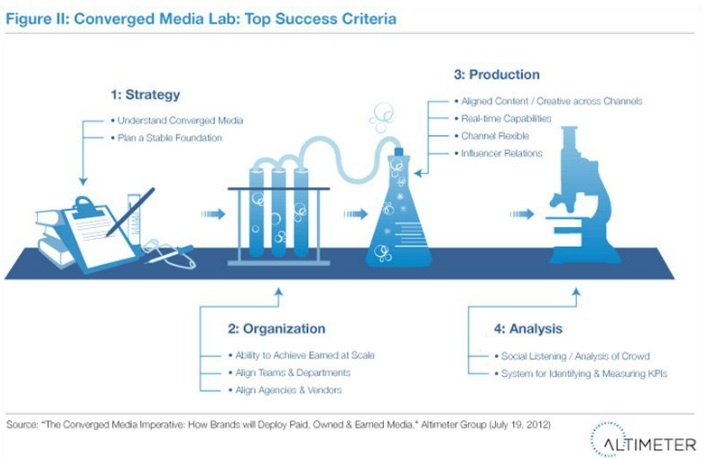 Once these “checklist” items have been crossed off your list, you are ready to begin the “Converged Media Workflow,” which provides a framework for how your content will be deployed across all your channels in an engaging way, while allowing room for strategic measurement and restructuring along the way. Influencers are identified and paid to create engaging, high-quality content and share it on their owned channels. This paid content was amplified as it was shared across social networks, driving readers back to the company’s social properties through links. As a result, the company saw over 1.1 million social interactions around its content (or 9,314 per piece of content). Make convergence a priority: CMOs need to “lead the charge” by bringing the right people to the table and establishing a mandate that convergence is a key aspect of the company’s marketing strategy. This means establishing and reinforcing clear goals and ensuring you are creating the right content to support your strategy across all channels. Find strong partners who will let you take the lead: Spending your budget in the right places, with the right people, was a top recommendation from interviewees. Agencies, vendors and creative partners should not drive your campaigns, but rather work collaboratively with you to meet the goals you establish. This means they will bring you tools and data that are meaningful for your specific needs. Make sure you have the right software system in place: With a plethora of software systems available to help you produce, publish, and measure your content initiatives (particularly on your earned media), companies should be careful not to invest too heavily in one vendor over another — without very close analysis of their capabilities. As the marketplace is heavily shifting and merging, be sure not to commit to any company that might ultimately limit your potential or restrict your desired strategy. 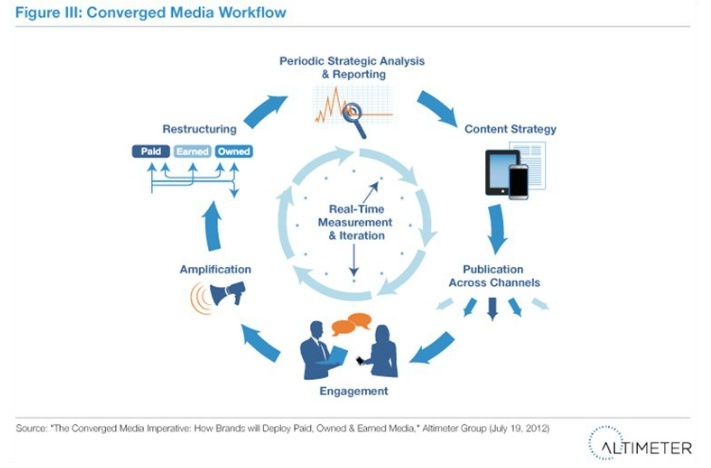 Converged media is happening everywhere we look, from social campaigns being promoted on billboards, to TV spots pushing content created by consumers. This integration can be powerful and enable your company to share stories in ways that were unknown before these digital times. Are you armed and ready for this change? 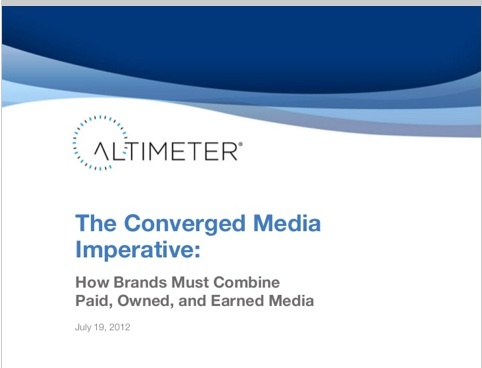 What examples of Converged Media programs have you found to be successful? Share in the comments below.